Originally published under the title, "Enemy of My Enemy: Re-evaluating the Islamic State's Relationship with the Ba'athist JRTN." 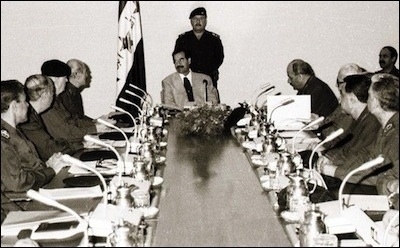 The Washington Post calls former officials of Saddam Hussein's Baathist regime "the hidden hand behind the Islamic State." Since the full-blown revival of Iraq's Sunni insurgency at the beginning of 2014, there has been much misunderstanding of the relationship between the Islamic State and insurgents of Baathist orientation, principally represented by the Jaish Rijaal al-Tariqa al-Naqshabandiyya (JRTN). Much of the discourse on this subject attempts to tie the JRTN to the Islamic State, arguing that a so-called "alliance of convenience" between the two groups has been key to the Islamic State's maintenance of power in areas outside of government control. Linked to this theme is the portrayal of the Islamic State as somehow Baathism reincarnated, most commonly noting the former careers that many leading figures in the group had in the security apparatus of former Iraqi president Saddam Hussein's government. The common notion of a Baathist-Islamic State "alliance of convenience" is mistaken. As such, it is worthwhile to trace the relationship between the JRTN and the Islamic State from the initial emergence of the former until the present day, primarily focusing on the aftermath of the United States' military withdrawal from Iraq at the end of 2011, in order to highlight that the common notion of the "alliance of convenience" is mistaken and that there is a clear dividing line between the two groups. Whatever coordination took place in mid-2014, in particular, soon dissipated as the Islamic State consolidated power and local territorial control at the JRTN's expense, so that the JRTN has largely descended into irrelevance. Consequently, whatever the veracity of claims by Shia militias that the JRTN leader and former aide to Hussein, Izzat Ibrahim al-Douri, was killed in mid-April 2015, the JRTN's impact on Iraq's security situation in the face of the wider Islamic State threat is minimal. The complete article cannot be posted for copyright reasons. For inquiries on obtaining the full article, contact the author at aaj892@hotmail.com.